The Congressional Budget Office highlighted that spending on food stamps increased by 135 percent, rising to $78 billion in 2011 alone. The ad was part of a series of Spanish and English language radio ads sponsored by the United States Department of Agriculture to increase enrollment in the federal food stamps program, renamed the Supplemental Nutrition Assistance Program or SNAP in 2008. As currently administered, the food stamps program serves more than 46 million people, or more than 1 in 7 Americans. When other federal nutrition programs like school lunches and breakfasts are added, the number jumps to 1 in 4. Since President Barack Obama’s 2009 stimulus bill expanded eligibility criteria to recipients making 130 percent of the federal poverty line – with flexibility granted to some states to extend coverage up to 200 percent – a record 14.2 million people have been added to the food stamps program since he entered office. By contrast, it took twice that amount of time for 14.7 million new enrollees to join under President George W. Bush. Indeed, the Congressional Budget Office highlighted that spending on food stamps increased by 135 percent, rising to $78 billion in 2011 alone. But the Obama Administration is still hungry for new enrollees. In targeting demographic groups like Hispanics, the elderly and low-income families that are likely eligible for SNAP but are not participating in the program, USDA made aggressive pitches to overcome resistance to getting on welfare. It is interesting to consider the lines of argument USDA employed to make its case. In its Spanish language “radio novellas,” USDA used a format popular with Hispanic audiences to substitute self-reliance with government dependence. In one ad, a conversation between two friends includes the following exchange. The implication of the ad is unmistakable: Smart people take all the government assistance they can get, regardless of need. While the Spanish ad tries to browbeat welfare skeptics into going on the dole, at least it doesn’t truck in the kind of false-on-its-face assertion that food stamps help female beneficiaries “eat right,” by which it is understood to mean eat healthfully. Simply put, people on food stamps don’t always spend their subsidy on healthful food. In many cases, the receipt of food stamps allows beneficiaries to be less healthful in their food spending. Indeed, the rise in childhood obesity among poor families is one of the leading health problems in America, and several studies have found linkages to obesity and participation in federal nutrition assistance programs like food stamps. Incentive structures for beneficiaries and food producers need to change if the government is going to effectively manage its food stamps program in a way that ensures it won’t create an obesity problem en route to making sure people don’t starve. But that manifestly is not what the Obama USDA was interested in doing with its radio ads. Instead, it chose to belittle Hispanics for trying to rely on work and family instead of a government handout, and it’s also falsely arguing that women on food stamps are healthier because of the program. 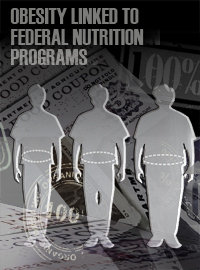 After a public outcry, USDA pulled its food stamp ads in late June, but not before giving Americans another brazen example of the lengths the Obama Administration will go to entrench its dependency agenda.